Scooter Braun on Kanye West's Cancelled Governors Ball Performance: "Stay Tuned"
After a rainy night and more bad weather on the way, New York City festival Governors Ball cancelled the third day of the event today. Kanye West was scheduled to close out Governors Ball tonight, and that leaves an obvious question: is Kanye going to do anything to make up for the cancellation? In 2013, Kanye headlined Governors Ball and delivered an amazing show, debuting unreleased material from Yeezus and parting the sea of concertgoers to perform in the middle of the crowd. It was one of the most memorable Governors Ball moments of the festival’s five-year history. 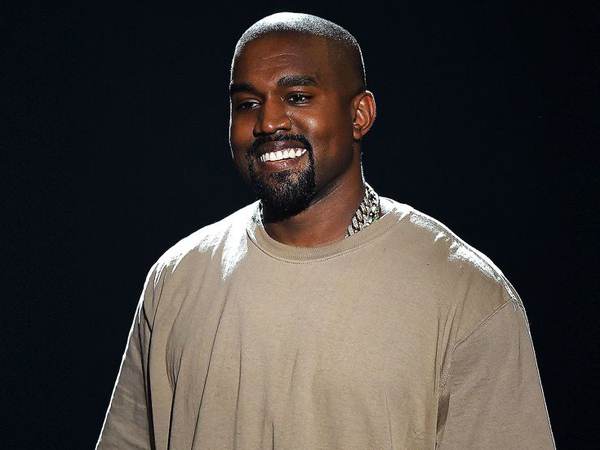 This year, the Kanye hype was at an all-time high. He introduced new merch, which people at the festival have been wearing all weekend, and everyone was wondering if he’d bring out special guests or give us a glimpse of what his upcoming The Life of Pablo tour might look like. 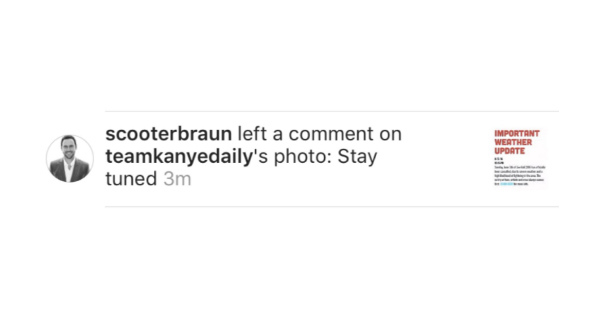 There’s already some speculation that Justin and Kanye may appear at Hot 97’s Summer Jam. Both Kanye and Bieber appear on Chance The Rapper’s new Coloring Book mixtape, and Chance is set to appear on the Festival Stage of Summer Jam tonight in MetLife stadium in New Jersey, right outside of New York City. G.O.O.D. Music is also scheduled to perform at Summer Jam tonight, with Pusha T and Big Sean as the two listed acts confirmed to appear. 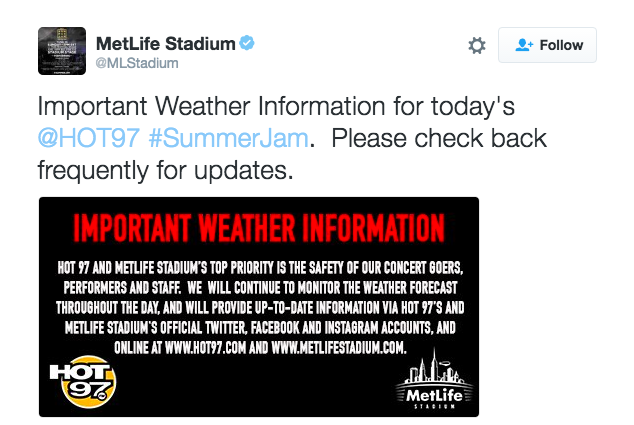 MetLife Stadium tweeted that Summer Jam will go down, rain or shine, but they are also keeping an eye on the weather. UPDATE 2: Ebro has confirmed that Kanye will be at Summer Jam.